Amarillo was built by merchants and boosters, who chose the site in Potter County for a town after the Fort Worth and Denver City Railway made plans to build its line across the Texas Panhandle in 1887. They built their stores in this remote area, catering to the ranch hands in the area initially, and waited the tracks to reach them. When the railroad was completed later that year, Amarillo boomed, quickly becoming one of the world’s busiest cattle shipping centers. With Amarillo’s population and economic opportunity increasing, a handful of Jews were attracted to the West Texas town, forming the foundation of a community that lasts today. As of 1898, there were three Jewish families in Amarillo: the Eberstadts, the Isaacs, and the Denitzs. The children of German immigrants, Adolph Eberstadt, a real estate agent, was a native of Texas, while his wife Hattie was born in Ohio. Russian-born Phil Denitz, who came to the U.S. in 1890, ran a men’s furnishings store, The Famous, with Joe Isaacs. By 1903, even more railroads – the Southern Kansas, the Pecos and Northern Texas, and the Chicago, Rock Island and Gulf Railroads – were built through Amarillo, attracting more Jews and non-Jews alike. By 1910, Amarillo had a total population of almost 10,000, which included ten Jewish families. Though a small minority, these Jews were at the forefront of the city’s retail trade. Alex Davidson immigrated to the United States from Germany in 1887. By 1900, he was living in Childress, Texas, where he owned a dry goods store. By 1910, he was settled in Amarillo, working as an ice manufacturer. Lewis Jacobson arrived in the United States from Russia in 1908. Soon after, he made his way to Amarillo, where he opened a clothing store. A year later, Lani Gilman left his native Russia, and by 1910, was a furniture dealer in Amarillo. Sidney Braunig, the son of German immigrants, was born in Shreveport, Louisiana. At the age of 19, he went to Denver, where he met a man who suggested that Braunig relocate to Amarillo and open a shoe store. In 1908, he did just that. Even without a formal congregation, the Jewish community in Amarillo observed the High Holidays. The first celebration took place at the Eagle Lodge Hall on Polk Street. In 1912, the community used the White & Kirk building for their Friday night services. Sometimes rabbis from Fort Worth, Dallas, or Denver visited, or else lay leaders like Braunig or Gilman conducted services. In 1913, the now 13 Jewish families in Amarillo formed their own congregation, Temple Israel. Without a building, they held services in various places, including the old Webster Building and the old Woodman Hall. Churches in Amarillo offered their space, too, including the Christian Scientists, the Central Presbyterian Church and the Episcopal Church. Temple Israel also started a Sunday School, which was conducted at the Eberstadt home at 1500 Fillmore Street. Hattie Eberstadt taught classes assisted by Ray Braunig. In 1916, women of the congregation founded the Ladies Auxiliary, with Ray Braunig as its first president. They later changed the organization’s name to the Sisterhood. The 1919 American Jewish Yearbook details the growth of the congregation since its inception. That year, Temple Israel had 30 members and an annual income of $1,800. It conducted monthly services in English and its religious school grew to 22 students and five teachers. Adolph Eberstadt served as president and Joseph Sklower as secretary. Rabbi George Fox from Fort Worth’s Temple Beth El visited the congregation regularly to lead services and provided guidance. With services in English and a Reform visiting rabbi, Temple Israel was likely Reform in orientation, though they would not join the Union of American Hebrew Congregations until the late 1930s. Over the years, the congregation fluctuated between Reform and Conservative Judaism. The 1920s was a growth period for Amarillo and its Jewish population. With the nearby discoveries of gas in 1918, oil in 1921, and helium deposits in 1928, the city’s population ballooned, increasing 178.4% from 15,494 residents in 1920 to 43,132 in 1930. Many Jews, mostly immigrants from Eastern Europe, arrived from other U.S. cities to open businesses to cater to these new residents. By the end of the 1920s, numerous Jewish retail establishments lined Polk Street. One resident remembers that possibly three-fourths of Polk Street stores were Jewish-owned. Perhaps the most popular enterprise for Amarillo Jews was the clothing business. Polish-born Dave Rubin and Russians Jake Blinderman and Lewis Jacobson all arrived in the U.S. between 1907 and 1910, each opening their own clothing stores. Emil Sauer emigrated from Bohemia in 1887, moved to Cooper, Missouri by 1900, and by 1930, established his own clothing shop in Amarillo. Leaving Russia in 1898, Morris Siegel came to Amarillo and opened a women’s clothing shop, Leslie’s Store. By 1930, Myer Sherman, who had arrived in the U.S. from Russia in 1903, established a ready to wear shop and employed Joseph Kapelus, a 1923 arrival from Russia, as assistant manager. Tailors, too, were notable career choices for Amarillo’s Jews. Russian-born Morris Bergman first settled in Kansas City, but relocated to Amarillo by 1930, where he opened his own tailor shop. Louis Meyer, another Russian immigrant, also established a tailor shop in town. Several other Amarillo Jews owned dry goods or furniture stores. Russian immigrants Abe Kessel, Ralph Sackstein and Nathan Kessel joined together to launch a general store. The sons of Russian immigrants, Harry Lipshy managed a general store while Morris Levine established one himself. Max Silverstein opened a competing dry goods store following his 1912 departure from Russia. Both Wolf Herring and Lani Gillman established furniture stores. Various other Jewish-owned businesses are found in census records. After leaving Romania in 1912, Sam Krasner lived in Missouri and Oklahoma before moving to Texas and establishing a window cleaning business. James Zofness left his native Russia in 1904. By 1920, he was a men’s clothing merchant in Bartlesville, Oklahoma, and by 1930, an oil promoter in Amarillo. Sam Zukav was born in New York, but made his way to Amarillo, becoming manager at a café. By 1937, 335 Jews lived in Amarillo, while 72 lived in nearby Pampa and another 75 in Borger. In response to this growth in the Panhandle’s Jewish population, Temple Israel purchased land at 2224 Taylor Street to build a synagogue. 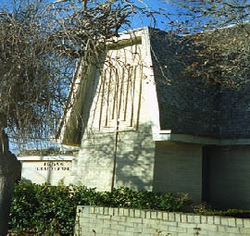 With the new name of Temple B’nai Israel, the synagogue was dedicated on November 10, 1929, with Rabbi David Lefkowitz of Temple Emanu El in Dallas and Rabbi J. Blatt of Temple Emanu El in Oklahoma City officiating. In addition, representatives from the Presbyterian Church and Polk Street Methodist Church attended. A few years before the dedication, the congregation hired its first spiritual leader, Rabbi Sperka in 1926, followed by a two-year stint by Rabbi Goodman. In 1934, they hired Rabbi Perry Nussbaum, a graduate of the Reform seminary Hebrew Union College, though he only stayed in Amarillo for a year. The following year, the temple hired Rabbi Alex Weisel, a Conservative rabbi, who served until 1939. From 1940 to 1945, Reform Rabbi Harold Gelfman led the congregation. During Rabbi Gelfman’s tenure, the congregation affiliated with the Reform Union of American Hebrew Congregations, though they seemed to have dropped their membership after he left. Though Amarillo was afflicted with drought and the effects of the Great Depression in the 1930s, the city was the regional center for various federal relief programs, especially the Works Progress Administration. Because of this, the Jewish community thrived during this time, increasing its population and founding various organizations. The Sisterhood, active for many years already, worked to dedicate a Jewish section at the Llano cemetery in April 1935, under the leadership of President Rose Aronson. Young Judea, B’nai B’rith, and the Zionist Group were also active by this decade. In addition to its regular Friday night services, Temple B’nai Israel sponsored a Sunday morning broadcast to reach its members in towns outside of Amarillo, like Pampa and Borger. Sunday school attendance grew to 39 students. World War II brought new Jews to Amarillo with the installation of the Amarillo Air Force Base and the nearby Pantex Ordnance Plant, which produced bombs and ammunition for the war effort. The Jewish community became especially devoted to serving the men at the military base during World War II. For example, the local newspaper many times advertised open houses at the temple for the servicemen. The Sisterhood held events like Thanksgiving dances, encouraging soldiers to attend. In 1943, Temple Israel had 53 member families. After the war, Temple B’nai Israel hired Rabbi Arthur Bluhm, who stayed with the Amarillo Jewish community until his death in 1962. Born in Cezkin, Poland, he served as a rabbi to various communities in Europe before he was arrested by Nazis in the fall of 1938. After he was sent to the Dachau concentration camp for 22 days, he was ordered to leave Germany, and immigrated to the United States in 1939. Bluhm formed close ties with the Amarillo community and its other religious leaders. The local newspaper often advertised his speeches, ranging from topics such as “What is Virtue?” to “Formulas for Living,” which were always open to the general public. In addition to acting as a part-time chaplain at the Amarillo Air Force Base, Rabbi Bluhm was involved in many civic organizations, including the USO, United Fund of Amarillo, Young Women’s Christian Association, Amarillo Friends of the National Jewish Hospital, and the Amarillo Rotary Club. 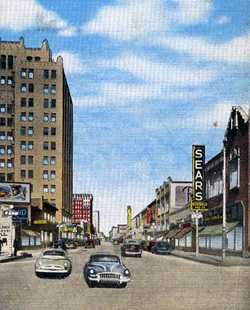 The 1950s continued Amarillo’s population growth. The city’s general population grew 85% from 74,443 residents in 1950 to 137,969 in 1960. Its Jewish population grew alongside, reaching its peak of about 350 to 400 Jews by the end of the decade. In 1951, the congregation built a new Sunday school building at the rear of the temple, and its enrollment increased to 60 by 1953. In 1955, B’nai Israel formally affiliated with the Conservative movement, joining the United Synagogues of America. Jews continued to move to Amarillo during the post-war years. Among them was Max Cohen, who moved to Amarillo from Dallas in 1951, opening Colbert’s Department Store on Polk Street. Later, Cohen opened two more branches of the store. Cohen was also a civic leader in Amarillo, involved in many organizations including the Amarillo Symphony, United Way, Junior Olympics and Better Business Bureau. In 1974 he was name the American Business Women’s Association Boss of the Year, and in 1988 the Texas Society for the Prevention of Blindness named him Man of the Year. Amarillo Jews have become an integrated part of local society and civic life. In 1993, Kel Seliger was elected as Amarillo’s first Jewish mayor. Serving four terms, he held the position until 2001. In 2004, he was elected to the Texas Senate as a Republican, representing District 31. He was reelected in 2008. Outgrowing its current synagogue, B’nai Israel purchased land for a new building in December of 1960. Construction began on October 1, 1967, and the temple, located at 4300 Albert Street, was dedicated in May of 1968. Rabbi Maurice Feuer, who replaced Rabbi Bluhm, conducted the dedication while various others spoke, including Rabbi Levi Olan from Temple Emanu El in Dallas and various local Christian ministers. In 1972, B’nai Israel joined the Reform movement, affiliating with the Union of American Hebrew Congregations. Rabbi Feuer left the congregation in 1978; since then, the congregation has had a succession of rabbis. The Amarillo Jewish community reached its peak in the early 1980s as the city became an important regional medical and research center. In 1982, B’nai Israel had 140 members. Many grandchildren of Amarillo’s early Jews, instead of continuing the family businesses, have either moved away or chosen to pursue professional careers in medicine or law. Thus, most of the Jewish-owned businesses on Polk Street have closed their doors. Since the 1980s, the Jewish population has declined, going from 300 Jews in 1980 to only 200 in 2000. It is probably smaller today. As of 2011, B’nai Israel, which numbered 60 families, had weekly Friday night services, a student rabbi, a religious school, and adult education classes. Although it has shrunk in recent years, B’nai Israel continues to be the center of Jewish life for the Texas Panhandle, serving Jews in Borger, Pampa, Hereford, Vega, Fritch, Perryton, Plainview and Memphis.